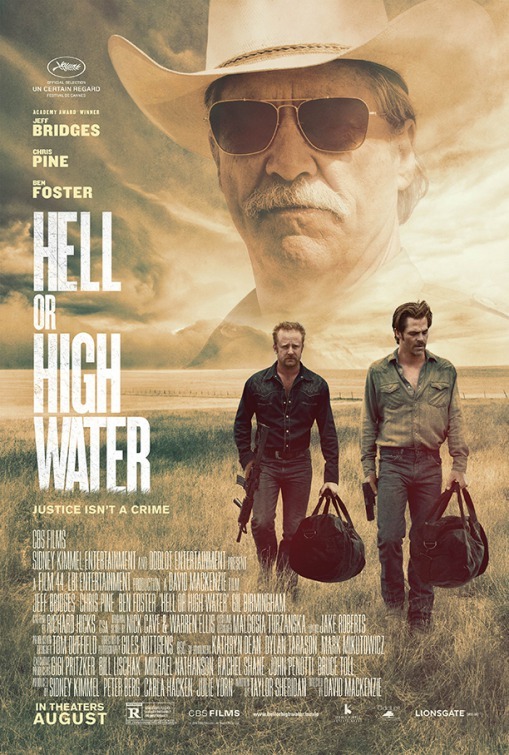 Hell or High Water could very well be the sleeper hit of the summer. It’s not a big action movie and there are no superheroes or aliens. Instead, there’s exceptional writing, stellar acting and an engrossing character story about a pair brothers who go on a bank robbing spree. There’s laughs and there’s dramatic, gut wrenching moments that will have you experiencing the full spectrum of human emotion. It’s a film that falls into the genre of modern western with the likes of No Country For Old Men, but with a better ending. First off, Taylor Sheridan does an outstanding job with the writing for the movie. The dialog is witty, truthful, natural and intelligent. It hits just the right notes for each character, and slowly changes pace as the story unwinds. Fun moments, off color jokes, and the teasing of the characters creates a bond between them and the viewers. The setting of rundown little Texas towns strikes a note at the plight of the working class. Yet the movie covers both angles, that of the bank robbers and their motivations, as well as the role of the lawmen who must stop them. It’s not about fun and games. When reality kicks in, it hits you hard, and this movie makes sure to cover that. Coupled with David Mackenzie’s superb directing, the film is able to present this story in its fullest capacity. The cinematography captures the landscape of settings, from the wide open plains of Texas to the little rundown towns dotted along its rural highways. The characters are captured in all their flaws and strengths, making them feel real and believably balanced. The pacing runs smooth and escalates to punch home those emotional hits as things come to a boil. But best of all, they end the story at just the right moment. It doesn’t go on too far or stop at an awkward moment. On top of all that is the acting. With the characters being such a strong focus of the story, there was a lot riding on the acting in this movie, and they didn’t miss a beat. Chris Pine and Ben Foster play a pair of brothers down on their luck and out to score some quick money. The chemistry between the two actors is down right perfect as they riff off each other but still put in powerful performances for each of the characters. Mirroring them is Jeff Bridges and Gil Birmingham, a pair of Texas Rangers who go out to stop these two criminals. Both of them are veteran lawmen with a cantankerous relationship that’s like a nagging couple who wouldn’t know what to do without each other. The way the characters develop and their portrayals sell the movie. You couldn’t ask for better casting or acting. In the end, everything comes together to make this movie something special. It’s one that’s worth owning as you’ll want to watch it again. I give it a five out of five metal bikinis.